In my never-ending quest for the best carrot cake, I think I may have just found it. It’s from Allrecipes.com and it’s called Best Carrot Cake Ever. Like just about every other reviewer, I made changes to the original Best Carrot Cake Ever. Notably, draining as much moisture as possible from the carrots for a firm and less mushy cake. Other than draining the pineapples well, I recommend following the recipe as written. Update: If you are following the recipe as written, keep in mind that when you add the raisins to the carrot and sugar mixture, the raisins soak up much of the liquid. If you choose to leave the raisins out and do not drain off the liquid, your cake will be very, very moist — possibly too moist and mushy. I recommend adding the raisins, letting them soak up the juice, then draining excess carrot liquid before adding to the batter. Shannon, I liked that one at the time, but my memory is so bad that I barely remember it! I need to make it again. I did like it, though. Plus it’s from CI so it has to be good :). I made this in a 9×13 pan- yowza!!! Just remember to add about 15 minutes to the baking time. Now, on to cupcakes!!! Sounds similar, with the macerated carrots and crushed pineapple. I guess I’ll have to try this recipe too, to find out. I used to be anti-carrot cake until I made Smitten Kitchen’s version. Her recipe made me a believer lol I’ve made it in cupcake & cake form and I’ve made carrot cake believers out of some of my friends as well. Great looking carrot cake! I’ve made a recipe for carrot cake from allrecipes.com and loved it! I’ll have to figure out which one it was and I’ll have to give your recipe a shot! I love carrot cake but have only made it a few times. I’m wondering if you couldn’t substitute the pineapple with a carrot puree (or even an apple sauce) in order to retain the moisture of the original. It’s something I have pondered in the past with other recipes, as well as why pineapple was paired with a carrot cake in the first place :). And I just made a pie, and now I want cake, it’s gonna be one of those weekends :). Since I am The Goodie Goddess of my hospital units and need to make several cakes (to share the love and calories evenly), I’m going to try this as a 9×13 pan recipe (much easier to transport and share for me). My mom’s zucchini cake recipe also uses pineapple for moisture and flavor, so this should also be a great cake. Anna – I buy bags of carrots that are already slivered. I do this because I don’t have a food processor and don’t want to buy one because it’s not an appliance I would use often enough to justify the cost. Any idea how much slivered carrots, chopped further, would you think I’d need to use? Martha, I’m actually testing a second version which may prove even easier to halve. If you do end up halving this one, just use 1 egg plus 2 tablespoons. 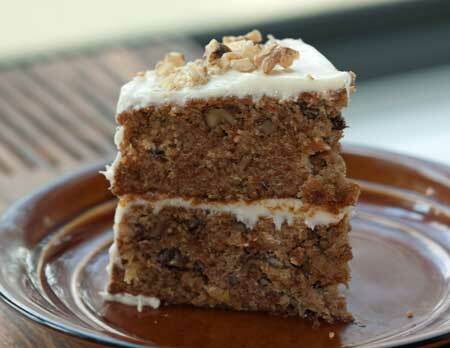 I love carrot cake and have been thinking about making one for a while now. Since, I’m part of a family of only 2 cake eaters, I may cut this recipe down again and only make one layer. I plan on bookmarking it so I don’t lose it. You may already know this but I reserve the canned pineapple liquid and use it in the cream cheese frosting in lieu of the lemon juice. Ties it together nicely. It is a recipe from an old neighbor! I like this very much. I’m baking it on Easter 2012. It’s going down. I like your coconut idea, too. Carrot cakes, like chocolate chip cookies, are so unique, it’s impossible to have just one perfect recipe for them–I wish I could recreate one I had at a cafe near my university–it was dark, spicy, with very thick, rich cream cheese icing that wasn’t sweet at all. Your cake looks wonderful, and so professionally displayed! I’ll have to give it a try! I love the use of dark and more natural, richer-tasting sugar. I like carrot cake but rarely make it. I default to the carrot cake recipe in the Silver Palate Cookbook. I hope I remember this one is here the next time I need a carrot cake recipe. Carrot cake is one of my favorites, but I have never made one!!! I like the Allrecipes site because of the reviews and tips. Thank you for taking the reviews and revising the recipe which saves the rest of us the trouble! This cake has more carrots and less oil compared to some-which is a good thing! Plus pineapple would put it over the top in the good category!